It’s Friday, which means that it’s time for our Destiny 2 Xur location and inventory guide. Unlike Destiny 1, where Xur was always present in a social space, the mysterious vendor can now be found out in the exploration zones. His currency is Legendary Shards, which can be obtained by breaking down legendary and exotic gear. Xur now stays from reset Friday morning until the weekly reset on Tuesday, so no more worrying about getting to him within a 48 hour window. This week, Xur is on Nessus. 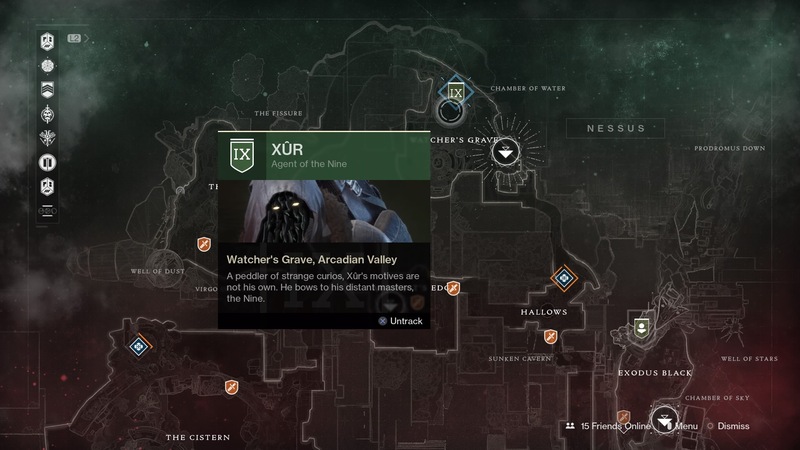 Fast travel to the Watcher’s Grave area and head forward and to the right to find Xur in a tree. You can mark his location on your map. This week, Xur is selling The Prospector Grenade Launcher for 29 shards. The Foetracer Hunter helmet is available for 23 shards. You can get An Insurmountable Skullfort Titan helmet for 23 shards. And finally, the Eye of Another World Warlock helmet for 23 shards. The Prospector Grenade Launcher allows you to hold down the trigger to fire multiple grenades in full auto, and then release the trigger to detonate them all. While this can be fun and interesting for trash mobs, the lack of precision, and not having a separate button to detonate really makes this weapon tough to figure out exactly when to use. Grenade launchers are still considered to be the worst weapon type in Destiny 2, so unless you’re completing your exotic collection, there’s not much reason to grab this. Foetracer allows Hunters to mark targeted enemies and deal additional damage to any marked enemies with low health. This is a great all purpose helmet for more damage output, especially if you have a team weakening enemies for you, though most Hunters will probably find that they prefer other exotic armor pieces over this one. An Insurmountable Skullfort is a great helmet for the punchiest of Titans. Arc melee kills will trigger health regeneration and restore melee energy, making it easy to get into the fray close to enemies. Keep this helmet in mind depending on what the Nightfall modifiers are, as any that recharge abilities faster will benefit from it. Eye of Another World will highlight priority targets and improve regeneration of grenade, melee, and rift abilities. This is a great all-purpose exotic helmet that just improves the Warlock class in general. Enemy awareness is great, as they are outlined in red, making manual target acquisition much easier. It may not do anything too crazy, but it’s worth having in the arsenal for the very moderate price of 23 shards. Bungie has announced a series of endgame changes coming soon to Destiny 2, along with releasing a trailer for the coming expansion, Curse of Osiris. We’ve also got a series of Destiny 2 guides, including an endgame guide for after the campaign, a step-by-step Raid guide, and a guide on how to trigger all heroic public events. Which items are you picking up from Xur this week?